Conservationists and scientists met in Kenya this week to come up with a last ditch plan to save the northern white rhinoceros from extinction. There are only five northern whites left on the planet—three live in a 700-acre enclosure on the Ol Pejeta Conservancy in central Kenya, while the other two are kept in zoos in the Czech Republic and the United States. "The battle is to work out what is feasible scientifically in the short time still available to us," Richard Vigne, the chief executive of Ol Pejeta—where Tuesday's meeting was held—told AFP. Northern white rhinos have suffered from the loss of their traditional rangelands in Central African Republic, Chad, northeastern Democratic Republic of Congo and South Sudan, nations that have been hit by decades of chronic conflict, lawlessness and misrule. "These areas are out any real control," said Rob Brett, Africa director at conservation group Fauna and Flora International. "Sometimes it's just not possible to do conservation." Poachers have also taken their toll, killing the animals for their horn—long prized for making ceremonial dagger handles in Yemen and, more recently, to be ground into a powder for medicine in Asia. Rhino horn is worth more than $65,000 per kilo on the black market, more than gold or wholesale cocaine. 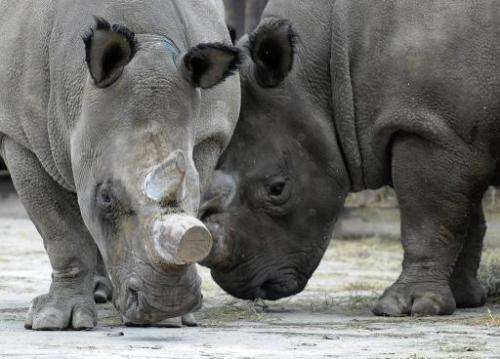 Past attempts at artificial insemination of northern white rhinos, carried out at the Dvur Kralove Zoo in the Czech Republic, failed, and surrogacy is untested. Stores of frozen sperm and eggs could be used to revive the animal artificially, but neither method will provide an immediate solution, meaning the northern white rhino will likely disappear, at least for a while. "They have been in a long-term decline for a number of years," said Brett. In contrast southern white rhinos which live in southern Africa have rebounded from a population of just a couple of dozen at the end of the 19th century to around 20,000 today, thanks to sustained conservation and protection efforts. But poaching is now on the rise, driven by demand from Vietnam in particular, with South African authorities saying a record 1,215 rhino were killed in 2014. The last population of wild northern white rhinos lived in DR Congo's Garamba National Park in the 1990s but was wiped out nearly a decade ago. In 1975 six animals were captured in southern Sudan and taken to the Dvur Kralove Zoo where four calves were successfully bred—but the last birth was 15 years ago. In 2009 four northern white rhinos were brought to Kenya in the hope that a more natural environment and the freedom to roam would encourage natural reproduction, but it was not to be. Last year was a torrid one for the rhinos, and for the conservationists who have sought to stop what now looks like their inevitable extinction. 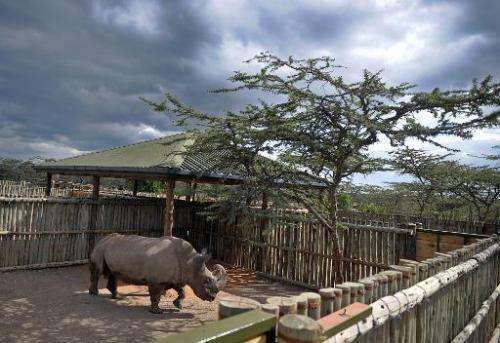 Two of the last remaining males died, one in Ol Pejeta in October and one at San Diego Zoo in December. At the same time vets determined that none of the four remaining females could reproduce naturally and that the last remaining male's sperm is of poor quality. 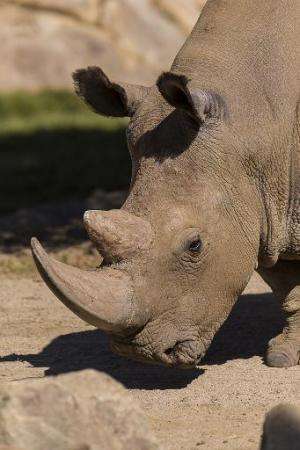 Two of the five remaining rhinos—including the sole male, Sudan—are elderly and have already exceeded the animal's life expectancy of 40 years. "This is the most endangered species of large animal on the planet," said Vigne. Behind him 24-year-old female Najin rolled in a mud pool to keep cool. "The chances are we're going to witness the demise of a species. That's the reality. They're going to die here," he added.